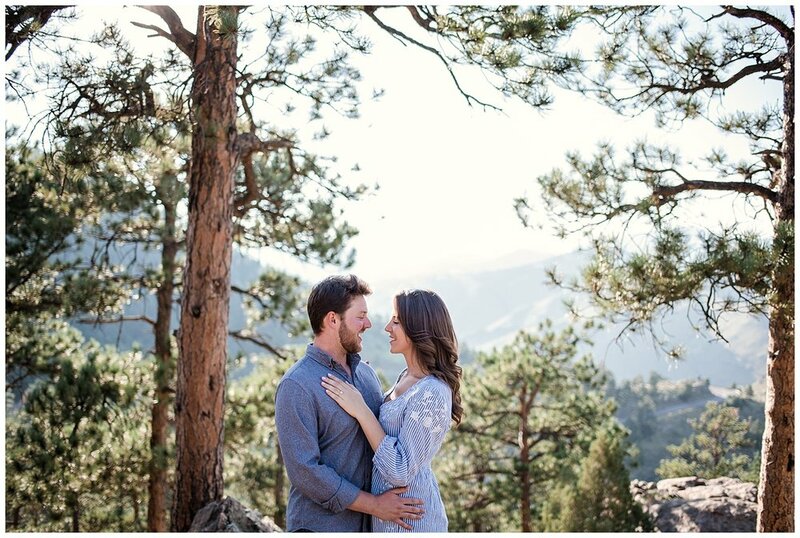 Lookout Mountain provided the perfect backdrop to their Colorado Engagement session with glowing trees and beautiful mountain views, absolutely one of my favorite Denver locations! They’re set to get married on June 9th at The Barn at Raccoon Creek and I cannot wait to spend their big day with them! In case you’re wondering here’s what the couple had to say after their session with me, which you guys I cannot emphasize enough that when couples put into words how they felt about our session and when they are truly in love with their photos - that is the best feeling ever. Molly is the BEST. We had our engagement photos done with her recently and 100% recommend her to anyone we know. She picked an amazing spot with exactly what we were looking for. Molly is so laid back and just wanted us to feel comfortable and have fun. We brought silly props and she was all about working on her toes to incorporate everything we wanted. She made us laugh the whole way through the shoot which is EXACTLY what we were hoping for. Even the photos that we were acting silly in turn our GORGEOUS...seriously! The lighting & editing is perfect and timeless. We can wait to share these photos for years to come. AND can't wait for Molly to be at our big day! We already know the photos will be perfect. Thank You Molly!! Want to see more engagements like this? Click here for all my other wedding blogs or here for another Mountain Engagement Session. Or better yet, like what you see and maybe - kind of - sorta want to work together? Email me at hello@mollymargaretphotography.com or fill out my contact form here!